We’re in the middle of the dog days of summer. The garden is producing and every day we’re picking a little bit of this and a little of that. The other day we harvested a handful of beans, a few Little Finger eggplants, some cucumbers, tomatoes, a couple of new red potatoes (yum!) and broccoli. Having all this fresh produce is fantastic. The challenge is eating as much of it as we can while it’s nice and fresh. The solution? Lots of salads. Not the traditional lettuce, tomato, cucumber salad. 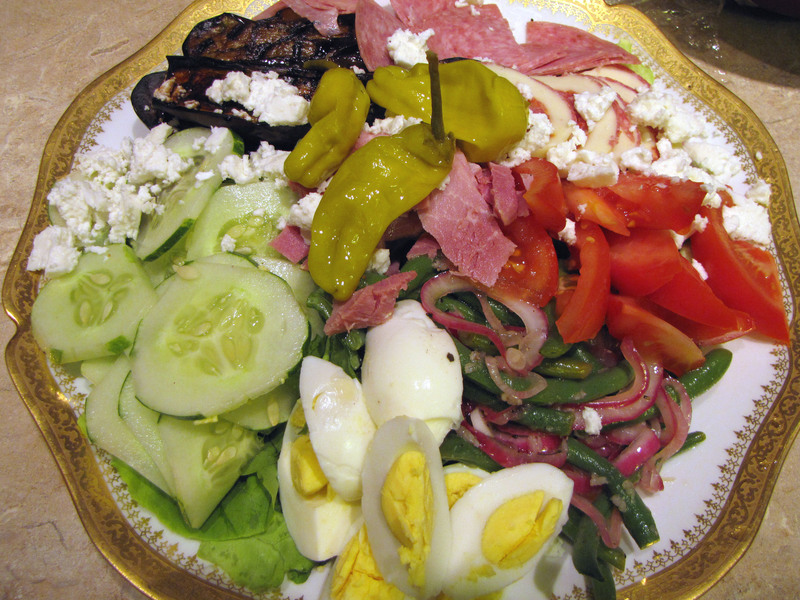 I’m talking about taking the every day salad and elevating it by adding roasted or pickled vegetables. Whisk together the oil and vinegar. Add the garlic, salt, pepper, olives and capers and set aside. In the meantime bring some water to a boil, blanch some green beans for 5 minutes. Let drain on some paper towels. Then boil the potatoes for about 5 minutes until tender. Drain. Add the beans and potatoes, while still slightly warm, to the dressing. That’s the base of the salad. You can eat it as is or add some hard boiled eggs, maybe some cherry tomatoes or artichokes. Use what you have on hand. This combination is also good with fish or chicken. We made it the other night and served it with ahi tuna. I wish I had taken a picture! Last night we made an antipast-style salad and added grilled eggplant and pickled green beans and red onions to it. Mix together the olive oil, vinegar, garlic, salt, pepper and then add the onions. Blanch the beans, drain, and add while still warm to the marinade. Let marinate for at least an hour in the refrigerator. When you’re ready, serve them as a side salad or add to a salad platter like we did. And this time I did take a picture! From the garden – cucumbers, tomatoes, eggplant and green beans. As a side note, you can also blanch carrots, cauliflower, broccoli or peppers for either of the above salads. You might also want to try my recipe for Crunchy Refrigerator Dill Pickles or Pickled Red Onions. So yummy. Great looking veggies Kim!